GULP… are you ready for this?! The THRILL RIDES at Disney World! Here we’ve listed all the attractions you’ll find at Disney World that are listed in the “Thrill” category by theme park/water park. Some are definitely more thrilling than others but to complete the challenge, see if you can conquer all of them! Take a deep breath now because chances are you’ll be losing your voice after screaming on one or more of these. Let’s kick this list off with Hollywood Studios, as we find this theme park holds the two greatest Disney World thrill rides in our opinion. 1 -Rock ‘n’ Roller Coaster – You don’t want to run late for an Aerosmith Concert right?! No worries, ride like a VIP in a stretch limo that goes from zero to 60mph in the blink of an eye. The awesome music, smooth turns and flips make this coaster a thrill seekers favorite stop. 2 – Twilight Zone Tower of Terror – Plummeting down an elevator shaft than back up again multiple times while surrounded by creepy sounds and spooky ghosts… sign us up! Don’t be fooled by Animal Kingdom’s cute animals and amazing atmosphere – there are thrills to be found in these four attractions. 3 – DINOSAUR – No worries here – you’re just being chased through a meteor shower by carnivorous dinosaurs in the dark in a time rover… it’s all good. 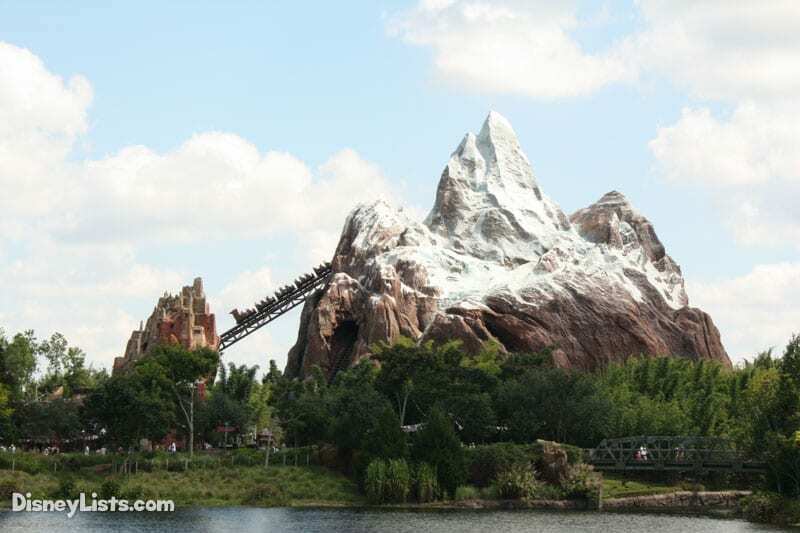 4 – Expedition Everest – There’s a Yeti on this coaster and he’s in a super bad mood – angry enough that he starts tearing up the tracks right in front of your eyes. Forwards, backwards, dips and turns, Expedition Everest is for brave explorers only. 5 – Kali River Rapids – Check out this river raft ride that is full of unexpected turns and keeps riders guessing on who is going to get drenched the most! 6 – Primeval Whirl – It looks innocent enough but once you get on this baby you’ll be surprised the whole way with it’s crazy mouse trap coaster feel of spins, twirls, and dips. Yes, EPCOT may be all about futurist attractions and global experiences but what is often forgotten are these neighboring attractions that definitely can shake, rattle, and roll! expect a thrilling experience! Go Orange Team if you are looking for the most intense thrill. 8 – Test Track – Design your ride (easy enough). Now it’s time to test it out in a convertible simulation car that will reach top speeds of 65mph. It may be a “Small World” at Magic Kingdom with lots of princesses and characters – but big thrills can be found at this magical place in these 4 attractions. 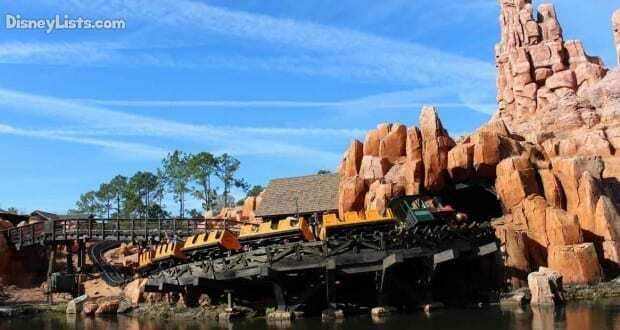 9 – Big Thunder Mountain Railroad – Get ready for a rough ride! Known as “The Wildest Ride in the Wilderness”, you’ll be shaken and stirred on this bumpy coaster. 10 – Seven Dwarfs Mine Train – The sweet dwarfs are inviting you to take a ride through their mine, but first you have to get to and from the mine on this smooth coaster with breezy turns and dips. 11 – Space Mountain – Our pick for the most thrilling attraction at Magic Kingdom, Space Mountain is a coaster that takes you through – well, SPACE. Darkness surrounds you as you learn very quickly that you have no idea which way you will go next! 12 – Splash Mountain – A super fun and entertaining log ride through Splash Mountain. But, wait a minute, why is it called SPLASH Mountain? Spoiler alert – you get spit out the side of the mountain during your scenic ride straight into the water below! 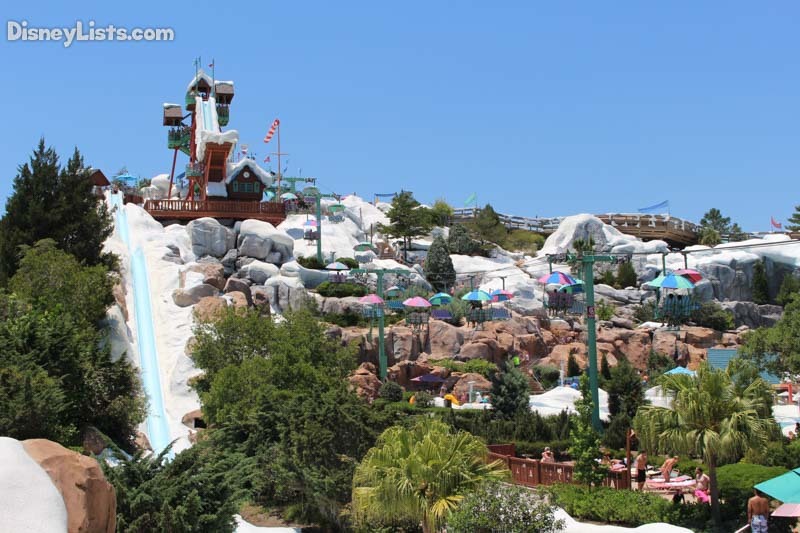 A shipwreck on top of a mountain amidst a beautiful tropical location – Typhoon Lagoon is a fantastic water park and these 5 thrill rides are definitely a reason to throw the swim suit on! 13 – Crush ‘N’ Gusher – The water doesn’t give you a break on this coaster like water ride. Hold on tight to your closest friend and get ready to be pushed through an array of tubes. 14 – Gangplank Falls – Rushing river rapids jet your tube of 4 passengers down what seems like an endless 300-foot water slide. 15 – Humunga Kowabunga – The fastest and steepest waterslide at Typhoon Lagoon wins our favorite at this water park for its thrilling, near vertical 5-story drop in the dark! 16 – Keelhaul Falls – This single-rider tube attraction will have you spinning around as you sail down the mountain side past boulders that you’ll feel the need to try dodging along the way. 17 – Mayday Falls – Mayday! Mayday! Are you ready to brave these rapids of the highest and longest waterslide at Typhoon Lagoon? Feel the chills of the “Blizzard” from its thrilling waterslides that will have you earning bragging rights the more thrilling you go. 7 thrill rides here to knock off your list. 18 – Downhill Double Dipper – 50 feet downhill in a dark enclosed inner tube while racing against a friend. We’re game! 19 – Runoff Rapids – On this attraction you can have 3 times the thrill as all three tubes are unique as you sashay down the mountain side. 20 – Slush Gusher – Yep, that’s AIR underneath you! Rocket down this 90-foot waterslide that offers a double dip to provide some air time. 21 – Snow Stormers – Watch out for belly flops on this fantastic waterslide that encourages belly sliding all the way down the curving mountain. 22 – Summit Plummet – The moment you’ve been waiting for – and definitely our top pick for the most thrilling water attraction. This baby is the tallest and fastest freefall body slide in the world!! Can you muster up the courage to plummet almost straight down 120 feet? This will likely be the toughest thrill ride on this challenge for most everyone to defeat! 23 – Teamboat Springs – Perfect for a group of 6, this thrilling attraction is one of the world’s longest group raft rides. 24 – Toboggan Racers – It’s a long way down, but you’re racing against 7 other contestants to get your toboggan to the bottom the fastest. Will you be king/queen of the mountain? There you have them – all 24 thrill category attractions at Disney World. Maybe you’ll conquer the 12 attractions within the four theme parks or maybe you’ll have the opportunity to complete all 24 with both theme parks and water parks. We’ve set the challenge – keep us posted on how many of these you can check off.